The best thing about this week is that when ESPN put out a couple of its boilerplate Top 25 offseason articles, each one had a blurbs about the Black Knights! Look, I agree that Hopkins’s arm made a gigantic difference last season, but it’s also soooo typical of mainstream sports media that their biggest reason for optimism is completely outside of what the Black Knights are trying to do on 90% of their offensive snaps. Personally, my biggest reasons for optimism are that the team returns three starters along the O-Line and that it has a legit shot at getting faster at slotback this season. Just a little more speed on the edges will increase this team’s explosiveness quite a bit. Replacing Nachtigal won’t be easy, but this team has plenty of leadership. We’ll see LB Cole Christiansen, S Jaylon McClinton, and CB Elijah Riley all in their firstie seasons. That’s a lot of leadership on the field. Army has to replace almost all of its starters along the D-Line. That’s the concern. NC State Chancellor Randy Woodson announces the selection of @BooCorrigan as our next Director of Athletics. Corrigan has had a lot of success since hiring Coach Jeff Monken to lead Army Football, but I don’t know how much fans are going to notice his departure. Personally, I think the football team’s turnaround owes more to LTG Robert Caslen’s tenure as Superintendent, and especially to the accommodations he allowed for Corps Squad teams’ training in the offseason. That was huge. More interesting are the projects that Corrigan is leaving either in-progress or on the drawing board. Army fielded three new Corps Squad teams on Corrigan’s watch, Mens and Womens Rugby and Womens Lax. The rugby teams are doing well. Womens Lax remains a work-in-progress. Corrigan also leaves a massive stadium expansion project on the drawing board, and at some point soon, Army Football is going to have to make a step-change in the quality of opponents it’s scheduling. The new AD is going face some exciting but very real challenges. It will be interesting to see who they pick and how they set the priorities over the next few years. #ArmyFootball is adding William & Mary defensive line coach Kevin Lewis and Stony Brook linebackers coach Matt Hachmann to its staff. I wish I had a take, but I don’t know anything about either guy. Last year was fantastic, but this year’s team was even more unbelievable. It has to keep being said over and over and over again – Monken and Army are doing this with a team full of players who would have a hard time seeing the light of day on most Power Five teams. The system keeps on rolling. It wasn’t just the second double-digit win season in a row; it was one of the program’s best years in its storied history. Beating Navy is always great, pushing Oklahoma to the brink was amazing, and hanging 70 points up on Houston in the Armed Forces Bowl was breathtaking. For the second year in a row, he did way more with way less than any coach in college football. I don’t know that this counts as news, so let’s do a comparison. What was that? 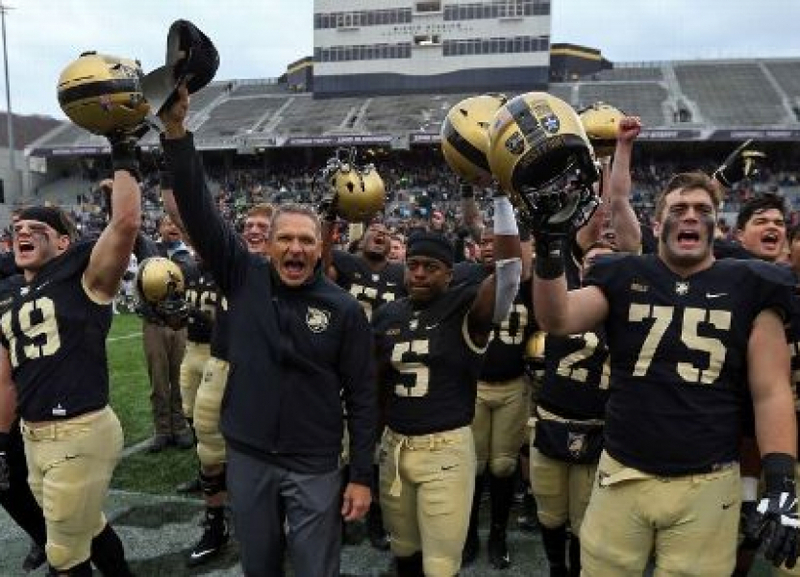 The offense did next to nothing, there was a run of seven straight losses, and there was another loss to Army. Niumatalolo is way too amazing a head coach to win just three games. Eh. Wait ‘til they start a plebe quarterback next year. Also: that underperforming defense lost most of its starters! Air Force is supposed to be a regular in the bowl world, but instead, his team couldn’t seem to win the close games and had its second straight losing season. The defense was even worse than the disappointing 2017 version. Air Force’s defense was definitely not worse in 2018 than they were in 2017. I mean, really? I’m all for hot takes, but that’s like back-of-the-barbeque, living-in-a-volcano, need-a-shot-of-penicillin-cause-it-burns-down-there hot. HOT! I don’t know that Calhoun is necessarily on the hot seat, per se, but he’ll have all the tools this season–and therefore none of the excuses. Army’s game at Falcon Stadium promises to be an epic grudge match. These teams play in what amounted to non-power conferences in 2018 (yes, including the Pac-12), but S&P+ says all of them were top-30 teams, except for Army, which it has down at No. 75. Still, the Black Knights won 11 games and almost beat Oklahoma, and the triple-option factor makes it extra hard to guess how the Bison would do against them. This would be such an interesting game. The median non-power FBS football program was losing about $20 million per year a few years ago, according to the NCAA, while the median FCS team was down about $12 million. That math isn’t perfect for a lot of reasons. But broadly speaking, it gives credence to the idea that playing at a lower level could help mitigate financial losses for some programs. They lay out a case in the next couple of articles based on attendance. The NCAA supposedly has a requirement for its schools to average 15,000 tickets worth of paid attendance per game. 34 FBS teams were below that line in 2017. It’s safe to assume that all of them are losing money pretty bad on FBS football. I personally love college sports, especially because I feel like I learned more about the way life really works from being an athlete than from anything else. But I hate the big-money aspects of college sports. It misses the point in a lot of ways when it becomes semi-pro, and for these schools to lose money on their revenue sports is pure madness. You got a story? Hit me on Twitter @dan_t_head, or hit us all @asforfootball. Thanks!